Since I’m a lover of pretty much all things pumpkin, I have always wondered about Pumpkin Butter, but have never tried it. Until now. I have a new love. 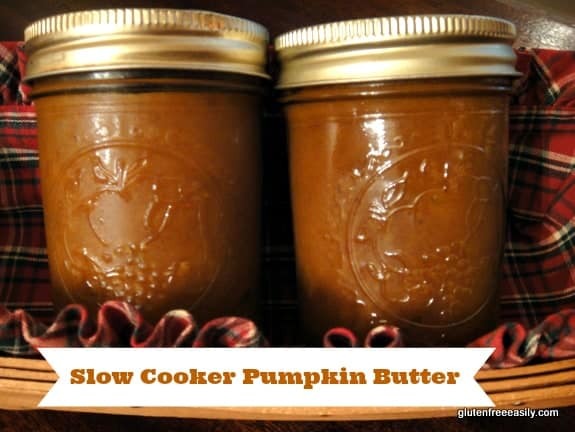 Slow cooker pumpkin butter. Glorious Pumpkin Butter. Ready To Be Transferred to Jars. 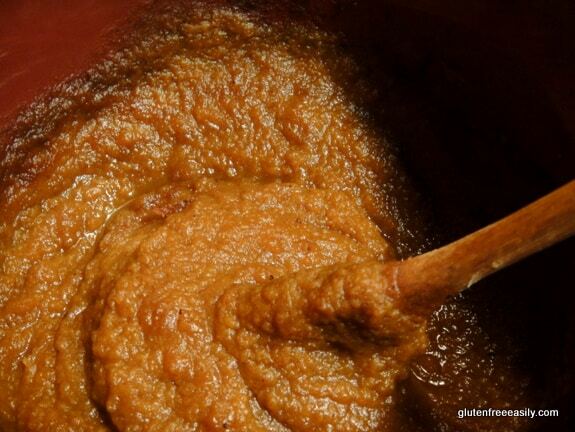 Pumpkin butter is naturally gluten free, of course. Naturally gluten-free foods (and recipes made from them) are my favorites and focusing on them first and foremost is the backbone of my gfe approach. See my incredibly easy Pumpkin Butter recipe below and then read on to get a bonus pumpkin recipe in today’s post in my Pumpkin Pie Plus … series. Pumpkin butter is one of those delightful concoctions that comes in a Mason jar and is often purchased at roadside stands and craft fairs. Guess what? You can easily make it yourself in your slow cooker. This slow cooker pumpkin butter is actually kind of magical in its velvety smooth goodness. Plus, it's naturally gluten free. Mix ingredients together well in a large bowl and transfer to slow cooker. Cook on low for 6 hours or longer. If some liquid remains at the end of the cooking time, remove lid of slow cooker and continue cooking for another 30 minutes to an hour, so that the excess liquid can evaporate. If you're prefer to make on the stove top: Mix ingredients together well in a heavy pot and cook over low heat, stirring constantly. Cook until thick (i.e., the consistency of any fruit butter, like apple butter). Let cool and store in refrigerator. I'm sure two teaspoons of pumpkin pie spice could be used in place of this recipe in place of the individual spices if necessary. Honey should never be given to children under 1. Either maple syrup or agave nectar can be used instead of honey, but both are thinner than honey. Therefore, I recommend using 3/4 cup of maple syrup and about 7/8 cup of agave nectar (no 7/8 cup measure is needed; just use a one-cup measure and use fill it slightly less than full). Note that canning pumpkin butter (or any mashed/pureed winter squash) is not considered safe. Because the raw honey acts as a natural preservative, this pumpkin butter will keep for up to 6 months in the refrigerator. Let me know if yours lasts long enough to test that out. I know ours won’t. I plan to use mine on bread, like the Classic Pumpkin Bread from yesterday’s post, as well as for savory dishes. Need to jazz up a chicken breast? No problem. Spread some pumpkin butter on it the last few minutes of cooking or right out of the oven or off the grill. How about a pork tenderloin made with pumpkin butter? That might make me push my Pork Tenderloin with Maple Glaze to the side, or perhaps I can just substitute pumpkin butter every time maple syrup is called for in the recipe. Now that’s an idea! Refrigerated jars of this pumpkin butter make great fall or holiday gifts. (I’m giving a jar to one of my girlfriends today as part of her birthday present.) Giving jars of the refrigerated version as gifts means that you can happily recycle well-cleaned, appropriately sized jars. A small jar for the newspaper lady (who always puts your newspaper in a bag when it’s raining) or a large jar for Aunt Harriet (who always gets you confused with your sister), or vice versa—you decide. Remember to include instructions on the label or gift tag indicating that the pumpkin butter must be refrigerated right away. For this recipe, I used my 4-qt crockpot and it was about half full. A bigger crockpot could not be used for this recipe as written—i.e., the same ingredient measurements; the recipe amounts would have to be doubled or tripled. Doubling or tripling the recipe would allow you to use a larger slow cooker if that’s the only size you have, plus it would allow you to make enough for several gifts. Also, a bonus of using my large slow cooker is that it has both an automatic shutoff and warm mode whereas my smaller slow cookers do not offer that feature. What’s that you say? Am I dissing you? No, not at all! Cushaw is a squash, not a put-down expression. To be clear, cushaw is my absolute favorite squash. In fact, most of the time when a recipe calls for pumpkin puree, I actually use cushaw squash puree. I talked about cushaw when I guest posted for Squash Fest over at Gluten-Free Homemaker’s site. 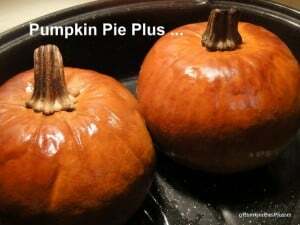 I actually use cushaw most of the time when I make my Pumpkin Pecan Pie. This pie is Mr. GFE’s new favorite. He says it’s tied for #1 pie with my Crustless Coconut Pie. But, the Crustless Coconut Pie has been tops for many years now, so this high ranking from a newcomer is huge! I think you’ll be impressed by this pie. And not just by the filling. Moi, the queen of flourless and crustless, actually made a crust for this pie. Okay, I confess it’s my Never-Fail No-Roll Press-In Pie Crust, the kind you mix in the pie plate and then press down with your fingers. Yes. Seriously. You didn’t think I was going to do a bunch of work chilling dough and using my rolling pin, did you? (You know me better than that, right?) Now go check out my Pumpkin Pecan Pie. Originally published October 28, 2010; updated October 10, 2018. I checked things out over at the Gluten-Free Homemaker and I must say, I like the idea of a press and bake pie crust! Interesting post with lots of good info. Your pecan pie looks delish. I’m a huge pecan fan, but have never made a pecan pie. Might have to try this cushaw version of yours, it looks soo good. Peace, love and harvest pies! Glad you found the cushaw post informative! 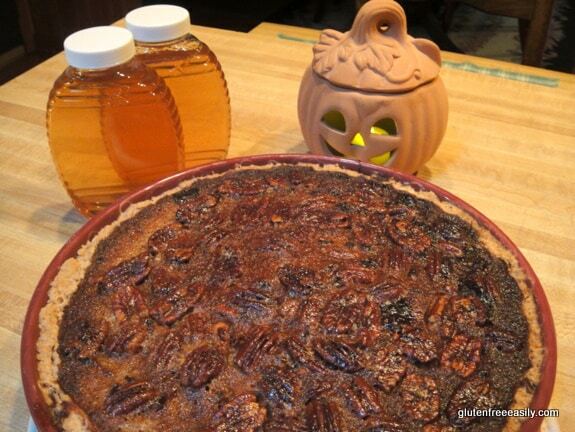 I bet you could make a healthier variation of the cushaw (or pumpkin) pecan pie. I plan to tweak it each time I make it. Will try coconut sugar next time. Love your signature … ahhh, harvest pies indeed! And, we can’t have enough peace and love. 🙂 Can’t wait to hear about CSA conference! Ok, sorry but where is the recipe for your press and bake pie crust? Pumpkin butter…I never would have thought of that one. Looks so yummy! What a great idea to give the pumpkin butter as a gift!! Last year we got some amazing pumpkin butter from the local farm we get much of our produce and meats from. The pumpkin butter was the most amazing thing I have ever had. I was eating it out of the jar with the spoon (much to the dismay of Kurt). I tried making my own after that, but did not love my recipe. I am so going to try this one though, because I think it would be a wonderful gift to give (with my homemade vanilla that I am making right now, thanks to you). Going to check out that cushaw pecan pie recipe now. I have never had a pumpkin (or cushaw) pecan pie! I cannot wait to see this recipe. I’ve never heard of cushaw before. Both the pumpkin butter and the pie look incredible. I love the food that emerges this time of year. I’m so glad you posted this. I’ll have to try it. I used to be able to get it in Atlanta and I would use it to make a pumpkin swirl cheesecake. I was just contemplating making pumpkin butter. I have a cinderella pumpkin that needs to be cooked, and I didn’t want soup…so that’s the plan. And your pie? Oh my word, yum! that pumpkin butter looks so delish! and that pie too! oh, pumpkin, i love ya!!! Hi Leslie–Welcome to gfe! 🙂 So glad you came over from Newlyweds Blog … what a great pumpkin recipe roundup, huh? I think you’ll really enjoy this pumpkin butter. If your pumpkin or squash has a higher water content, it may need to cook longer in the slow cooker (or pot on stove) and have the lid off longer towards the end of cooking in the slow cooker. Hope it turns out well for you! Pumpkin butter sounds delicious. I like apple butter, but it’s too spicy for my system. I’ve never tried making my own, but as I read over your recipe I thought, “Of course! Make my own butter and I can control the amount of spice.” I’ll have to try this. I’m also a lover of all things pumpkin but I hadn’t heard of pumpkin butter before! Maybe that’s not so strange though because I hadn’t heard of apple butter until a few months ago lol England is definitely lacking in some food stuffs! This seems a nice recipe though so I’ll give it a try later this week 🙂 Thanks for sharing! Hi Aurelia–Welcome to gfe! 🙂 Both pumpkin butter and apple butter are easily made in the slow cooker. I’m awfully partial to this pumpkin butter though … hope you enjoy it! I’m making the pumpkin butter in my slow cooker today – I used a 29 oz can of pumpkin and less than a cup of raw honey. It’s VERY thick already even before cooking. I compared other recipes online and many recommended adding apple cider or juice. Is it supposed to be very thick from the get-go? It has been cooking several hours now and is thickening even more. I don’t mind it thick but want to be sure I’m doing it correctly and getting the correct yield. Thanks for the recipe! I love it – I’ve stirred some into my coffee with vanilla almond milk as “creamer”. Very yummy! Hi Brandae–Welcome to gfe! 🙂 So sorry I couldn’t respond to your email yesterday. I was on travel at a conference-type event. I didn’t find my mixture to be very thick before cooking. It was think, but I wouldn’t say very thick. You used just pumpkin, right? Not pumpkin pie mix? How did it turn out? I’ve got my fingers crossed that it was still great. Oh, and it sounds like you made an instant pumpkin spice latte-type concoction–yum! Yes, ma’am, it still turned out great. Thanks so much for your personal reply. I’m enjoying your blog! Shirley – I’m trying to replace butter and oil whenever I can. This would be ideal for spreading on toast in the morning (or muffins or anything!). I’m going to throw it in my crockpot before I go to bed tonight. Yum! Thank you! Hi Ellen–I think you will really love this recipe. 😉 Can’t wait to hear what you think! I grow butternut squash, so I usually use those in recipes calling for pumpkin. But this year, I ended up with a little army of sugar pumpkins, so I get to use actual pumpkin for your recipes. The pie looks amazing, thanks for sharing with the Hearth and Soul hop. Happy to link up to you girls’ great weekly event! Oh a new squash to explore – I hope I can find some around here. I love that your pumpkin butter has honey in it – yum! I will never again buy pumpkin butter the real stuff is 100% better! Thanks for sharing both recipes with the Hearth and Soul hop!! H Christy–If you can’t find any cushaw locally this year, you can be on the lookout for it for next fall. 😉 The pumpkin butter is the best if I do say so myself. Yep, no need to buy pumpkin butter any longer. Homemade is so much better and healthier–just love it! I have a couple of cushaws left- I’ve got cushaw butter on the agenda for this weekend. Apparently cushaw butter is a tradition in Tennessee. (Envying your local honey to make it with! 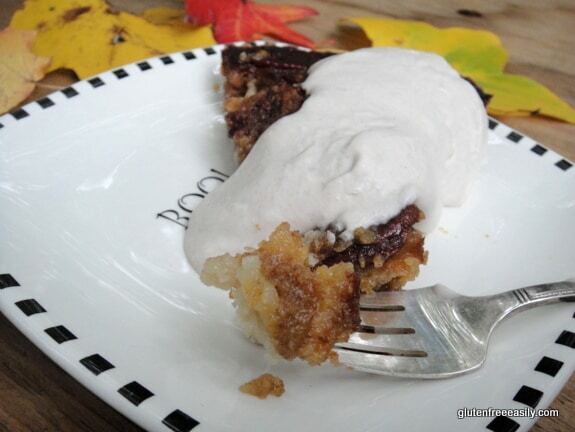 )I also want to try your cushaw pecan pie. I’ve made two different pies with the cushaw so far this year but none with pecans. I got my cushaws from my brother, who grew them from saved seeds. (both green striped and yellow striped) I saved my seeds and will try them next year, but I have the same deer problem. Sisson’s produce in Montross had them early in the season, and should have them again next year. I’ll let you know if I see them anywhere else. Hi Betty–Great to see you again! 🙂 You have some beautiful stuff over on your blog of late! Now re: the cushaw … I’m not sure which I’m more excited about … the fact that someone else knows about cushaw or the fact that you have just told me I can find it locally next year! I’ll be at Sisson’s as early as possible next year to make sure I get enough of my beloved squash! I hope you love the pie when you make it–we sure do! It seems it’s friends and family saving and sharing seeds that are the way most folks are growing cushaw. I’m not sure if I’ve seen the yellow-striped before–exciting! Is the taste the same? Maybe you could build a little screen igloo around the cushaw to thwart the deer. There must be some solution, right? Thanks so much for sharing all of this good news, Betty! I’m thrilled to know there’s a local supplier I can go to next year. 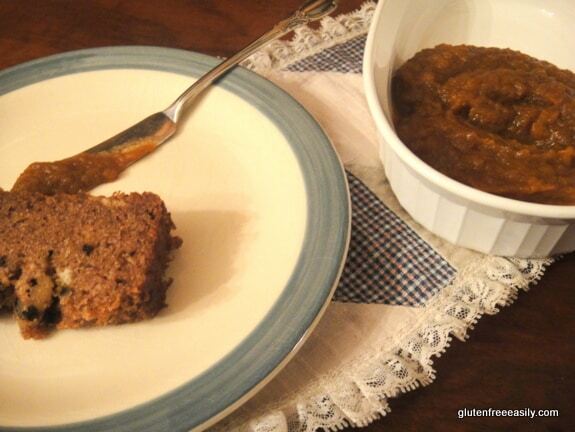 Shirley – I made this in my crockpot and it is fantastic! It thickened up considerably, which I prefer. I just have a little evening waffle snack and smeared it with the pumpkin butter. Whoa! It is delicious! Thank you for sharing the recipe. And btw, how easy this recipe is. I threw it in the crockpot one night before going to bed. It was in there on low for about 6 hours, then I continued cooking it for another couple of hours with the lid removed. Can I use a substitute for the raw honey? Maybe maple syrup? I have a little one that is not quite 2 years old yet and can’t have the honey. My little girl and I love your recipes! The maple syrup worked like a charm! Great substitute! I used 3/4 of a cup vs a whole cup as recommended. Lane–That is such great news! I’ll make it myself that way next time. 🙂 I really appreciate you reporting back, Lane, as not everyone eats honey. I’ll update the recipe in the post, too. I just wanted to let you know that the USDA does not recommend canning pumpkin butter. It can’t get hot enough in the middle apparently. The recipe looks great though!! Hi Tammy–First, welcome to gfe! 🙂 Second, I so appreciate you sharing this info. I’ll update the post immediately. BTW, in reading all the info, I did find that pumpkin butter will keep the refrigerator for up to 6 months. Wow, huh? I can’t imagine it lasting a fraction of that time, but it’s all critical info to know. Thanks re: the recipe! It’s amazingly delicious. And I don’t brag quite like that about most of my recipes. 😉 I took a quick look at your blog. Loved seeing all your beautifil knitted creations and congrats on the new furbaby! Thanks again, Tammy! I just made the pumpkin butter and it’s amazing. My husband and I went off of refined sugar so we can’t buy the pumpkin butter that we love from Trader Joes anymore. This is fantastic and will satisfy that craving. We put it on our oatmeal this morning–super yummy. I’m going to check out your other recipes. Thanks! OK so first I have to make this and then I can make the pumpkin latte. I’m so glad you posted this. Years ago I used to be able to find pumpkin butter and I would use it in desserts, so yummy. Bless you for posting a crock pot version, and it’s SCD legal too. You are my hero! my pumpkin butter is finishing up in the slow cooker now. how do you not just a spoon in it and eat it up before it even gets put in jars. i love it. if there’s any left I will have to make that Pumpkin spice latte which is what I was after in the first place. Hi Kathy–LOL … I know! It’s so easy and just so good. I think you’ll love it in the Pumpkin Spice Latte. In fact, you might inspire me to make a new batch of pumpkin butter while I’m sleeping tonight. 😉 Having some Pumpkin Spice Latte in the morning would be fantastic. Made with almond milk, it’s just exceptional IMHO. i now have so many of my facebook friends wanting the recipe. you will be very popular on my facebook page if that’s ok with you. Kathy–You are a doll … thank you so much! 🙂 I’m guessing that your FB friends are not all gluten free either. I especially love that factor as it shows that good recipes can “bridge the divide” and work for all of us! I just love naturally gluten-free recipes. Thanks again! Fixed myself a mug of the Pumpkin spice latte this morning. Although I like it, it just seems like something is missing. It seemed a little weak in the flavor. I even added an extra tablespoon of the pumpkin butter. Any suggestions? I can’t put my finger on what seems to be missing. Hmmm, Kathy. I use the Silk Almond Milk (unsweetened). I’ve heard that some almond milk has more of a water consistency. Darn, I hope it works out for you. I’m going to have a crock pot of this cooking on Thanksgiving day, JUST FOR THE AROMA, then dish out the finished product to send home with guests!!!! Hi Laura–Welcome to gfe! 🙂 And what a lovely idea! I will have to share it on my gfe Facebook page for sure–thanks! Thanks so much for commenting and sharing your great idea! Just pinned these recipes! Thank you for sharing. Have a Cinderella pumpkin. I’ll make the butter with that! I just started canning last month. I believe you can can pumpkin in a pressure canned. That’s my next purchace. Have a blessed day. Hi Zandra–Welcome to gfe! And thank you so much for sharing these recipes with others! 🙂 I have never eaten a Cinderella pumpkin, but I know that many love them. 😉 And folks do love pressure canning. Around here, I think pressure canning is recommended as the safest for everything. Canning is a great skill to have! Hope you enjoy your pumpkin butter and other recipes. I am anxious to make my first batch for the year! This looks wonderful! We love all things pumpkin! Coming to you from Savoring Saturdays, sharing! This sounds delicious, Shirley! Thanks so much for sharing it at Savoring Saturdays! Shirley, I love your website and have made soooo many wonderful dishes from your recipes. This pumpkin butter recipe has been on my radar for a long time. I haven’t attempted it because I have a question. Do you spread the mixture directly into the bottom of the crock pot or put the bowl with the mixture into the crock pot? I looked through the questions but didn’t see this one. Thanks very much for all your hard work. Hope to taste this soon. Thanks much for your answer. It is cooking away. The kitchen smells wonderful. I follow you on Facebook and love all that you share – your recipes and those you collect from other sites. I don’t have Celiac. But I’m extremely allergic to wheat. So I have been saved by your kindness. I found your site right away, when I started looking for non-wheat recipes many years ago. And through your generous posts, I’ve learned about other recipe innovators. I love all the stories you share, about Mr. GFE, your son (in NYC?) your DIY vanilla (love it!!) and the bees you keep for honey. Thanks again, for all you do. Yes!! I just bottled it. Soooo delish. Can’t wait to bring it to my daughter’s tomorrow so my 2 1/2 year old Grandson, Evan can try it. He loves your pumpkin pie. Much love to you and your family.